One of my goals with this blog is to not only talking about comics,movies, TV shows and gaming, but to also discuss cur thrall events that I attend from time to time. I’ve been severely slacking on this side of things (my bad) so I’m hoping to start putting that right in the coming weeks. Winter is most definitely on its way, which is usually the time of year that I switch into hibernation mode. I basically stock up on as much junk food as is humanly possible to consume, make sure my Netflix bill is paid up and blow the cobwebs off the video games I bought 7 months ago and never got around to playing. So, before I start taking such drastic measures, I figure I have a few weeks left to actual get off my arse and actually see some stuff. 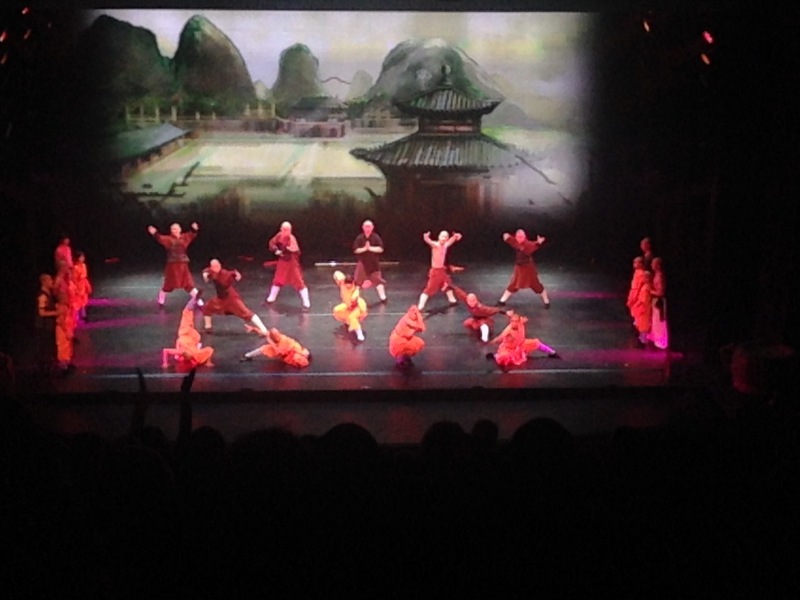 Thanks to my vastly better half, I had the chance last night to visit the Peacock Theatre in London and watch the mind-bogglingly good ‘ Shaolin: Wheel of Life’ stage show. For those who may be unfamiliar with the basic set up, it’s a piece of performance theatre, performed by bonafide Shaolin Monks from the mountains of China. The monks perform a number of eye-poppingly dangerous demonstrations of their skills, that will leave you gasping at the almost super human levels of skills. There was a few stunts in particular that the monks performed that had us wincing with existential pain. Sorry, couldn’t get a better picture, was sat pretty high up, but you get the gist of things. Now full disclosure, I have seen the monks perform before, I went to see them the last time they were in London back in 2009. The major differences between the current show and the previous show appear to be in the presentation. This time around, there is a wide focus on framing the performance within the framework of a rough story. 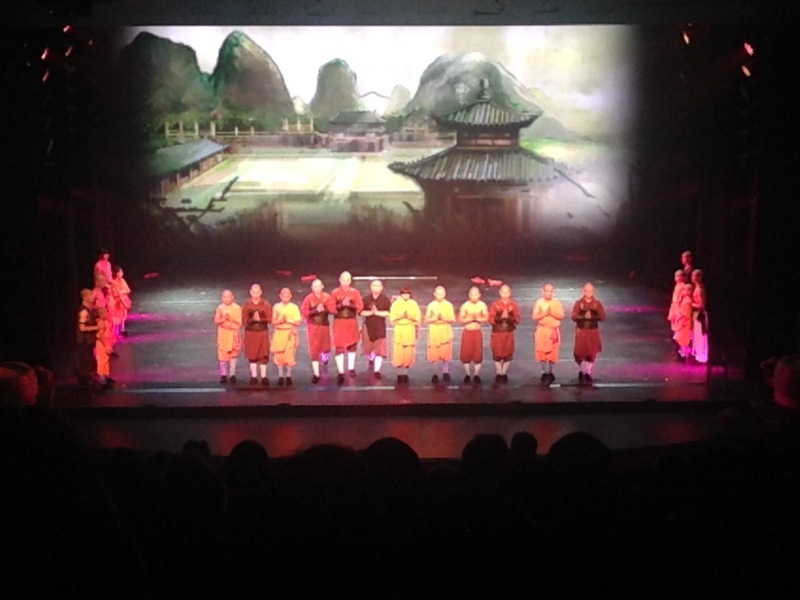 Essentially, the performers are telling a story about the Monks origins in Shaolin, their fractious relationship with the then emperor of China, and the battle to preserve their way of life whilst hiding away from the forces attempting to destroy them. The storyline is an interesting side show, but frankly, it seemed to go way over the heads of most of the audience. The only thing people wanted to see was more death defying displays of martial arts prowess and agility. Fortunately, the whole performance runs along smoothly, so no one had to wait long for what they wanted. This is a great show that’s suitable for all the family (there were many kids in the matinee performance we attended), the young and old. The performers deserve the highest admiration for the levels of agility they can display, and it was nice to see so many women and children now a part of the show. The children in particular went down a storm with the audience and rightly got the biggest cheer of the night. Unfortunately, the show has now completed it’s London run, but it is likely to be touring around the country, so if you get the chance to see it, I strongly recommend you do! A quick visit to Google will let you know when they are performing in your part of town, but if you’d like a taste of what the show is about, you can find it here.